My sewing time over the last few weeks has been spent buried beneath a pile of drafting paper and muslins. When I went on a pattern drafting course at the London College of Fashion last year I learnt so much, but I'd also hoped to come away with a usable sloper on which to work from...unfortunately, their standard pre-drafted slopers were just all wrong for my own body and no amount of fiddling around made it feel quite right, so it felt better to start from scratch. While drafting a bodice from scratch that fits perfectly is relatively trouble-free, I've never quite succeeded in drafting a sleeve pattern that fits perfectly - there always seems to be some kind of compromise or way in which I'm left feeling it could be better next time. So in my last few weeks running up to the summer holidays I determined to spend whatever sewing time I've had at my disposal cracking my sleeve issues. I have drafted sleeve after sleeve, toiled each one and then taught myself how to make proper changes to them by studying from a multitude of books. I have a new appreciation for how the sleeve must work with the whole bodice, rather than seeing them as two isolated things, where only the armhole and sleeve cap must marry up. My dressmaker's dummy, with all its balance lines, has allowed me to finally understand visually whether a sleeve is technically right, as well as just looking 'sort of right'. It's always unnerved me to put a sleeve in knowing that while I might have made it work somehow, it may not be technically correct, so it's a little bit thrilling to finally create a sleeve sloper where the balance lines on the sleeve and bodice pieces match up perfectly, the arm can move freely without pulling at the bodice or over the bicep* and there's just the right amount of ease at the back of the arm...it's taken such a long time to get to that point. So with very little to share with you other than a pile of paper and some cotton with lines drawn all over, I'll tell you about 'other things' that I've been enjoying. Every Tuesday for the last few months the postman arrives with a card from my sister. 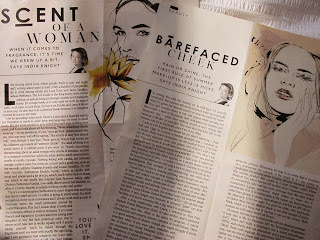 Inside, torn out from the Sunday Times at my request, is India Knight's beauty column. These columns are utterly self-indulgent, but also quite delicious. I save each new installation to read when I get into bed that night and at around six o'clock in the evening I'm already looking forward to the moment when I can begin reading. I have no idea quite why her column is so compelling as I haven't bought any of the products that she's recommended (due to them being obscenely expensive), but I love how geeky it is, how seriously she takes it all (while pretending not to) and how, for five minutes at least, it offers up the curious idea that the solution to most problems may be solved with a particular jar of something...or just a Mason Pearson hairbrush (my daughter was given one of these as a gift on her first birthday and still uses it every day a decade later and she does indeed seem a happy creature, so I'm very tempted by one of these). 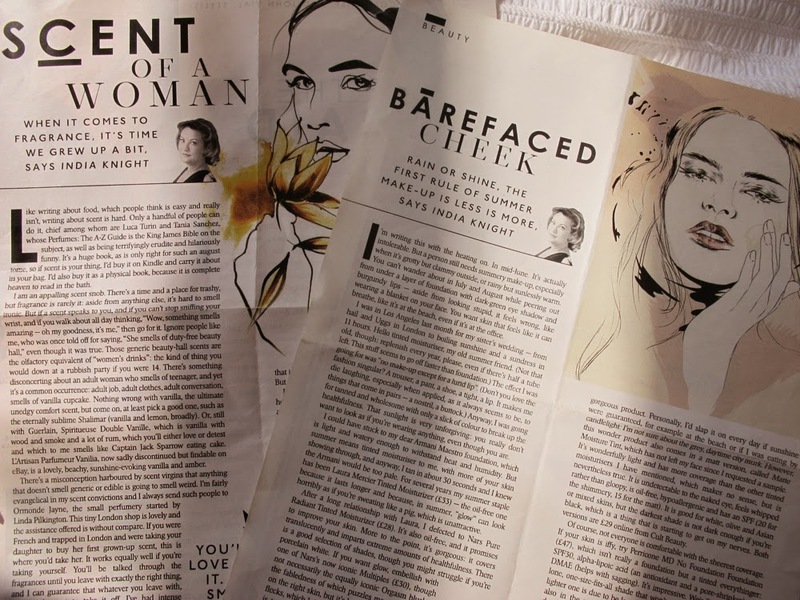 I think having it a arrive as a page quite separate from the rest of the newspaper adds to my pleasure in it. When I'm not eeking out my one page from the newspaper, I'm attempting to read Instructions for a Heatwave by Maggie O'Farrell - I've read most of her books and loved all but one, so I was delighted when a friend bought a copy of this for me and the title feels particularly pertinent as England sees itself in its second week of temperatures comfortably above freezing. Unfortunately though, every time I open it to read, I fall asleep almost instantly and it's taken me nearly two weeks to finish the first chapter. This is no reflection on the writing as it actually seems like it's going to be very good and I'm looking forward to an evening when I manage to keep my eyes open and can get stuck into it. 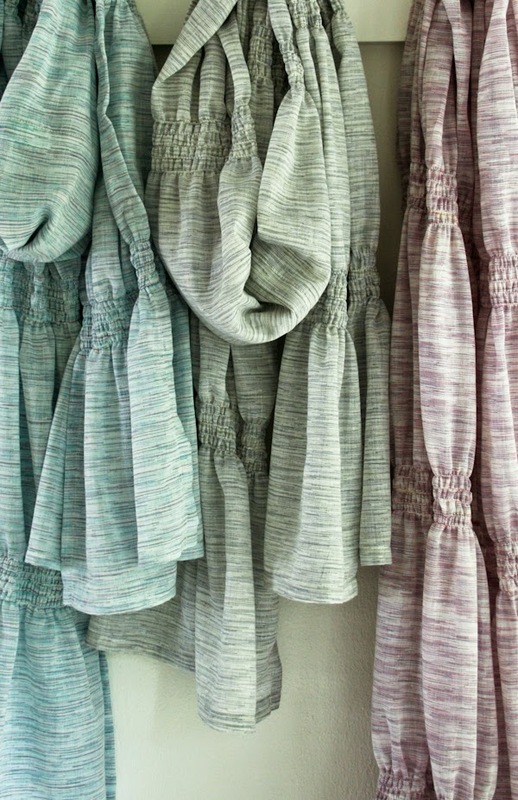 I spotted a tutorial for making these scarves last week on the Purl Bee. Despite have had a shirring addiction in the past and owning a shop-bought scarf almost identical to the ones shown above, it had somehow never occurred to me to reproduce the scarf and make it in other colours until I saw this. You can find the Purl Bee's tutorial for doing so here. I love this idea. A few weeks ago I also bookmarked a brilliant tutorial from Kate about how to make a terranium. I'm now keeping it up my (much toiled, finally balanced) sleeve for something to do with my children over the summer holidays. 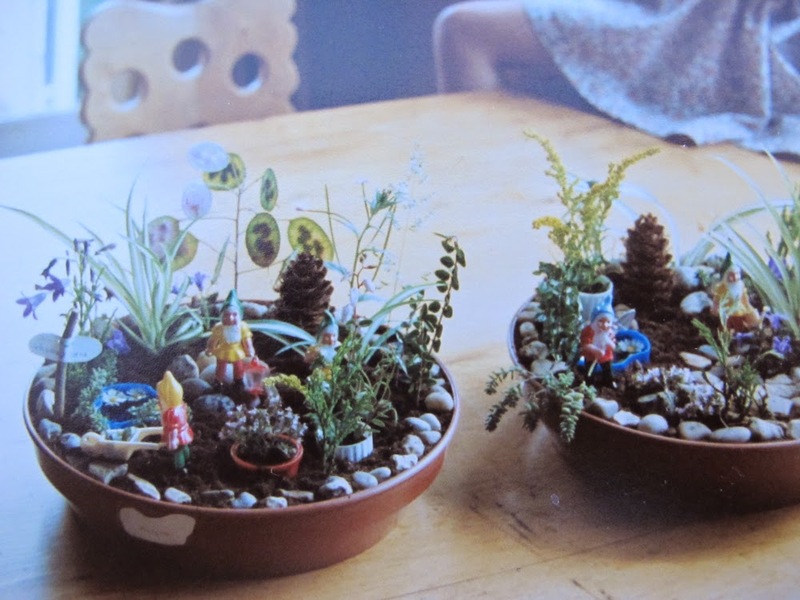 Whenever we go to the garden centre my children make a beeline for the succulents and cacti so I know they'll love the idea of creating a miniature garden from them and it has a feel of the gnome garden about it that I so enjoyed making with my grandmother years ago (pictured below)...especially as Kate has curiously chosen to add polar bears to her terranium. Thank you for the inspiration, Kate! Finally, and unrelated to anything, I had a bowl of Cocopops last night for the first time since I was about eight years old. I have a mixed indulgent-puritanical food stance: I'll happily eat chocolate and cakes, but I don't buy any foods that could be savoury - such as a breakfast cereal - but have been meddled with to make them something other. I prefer to eat healthily when I'm eating a meal and to have a treat clearly defined as a treat, rather than a pseudo-meal. I've no idea why the Cocopops made their way into my basket, but I think I may have been subconsciously pondering making rice crispy cakes, but was unable to find the plain variety in our tiny local shop...at which point something short-circuited and their bechocolated cousins came home with me anyway). They are pure heaven! I had forgotten quite how good they are. I'm now considering saving them as a weekly Tuesday evening treat to be consumed alongside the India Knight column. Although their presence in the cupboard causes much consternation due to them having been given a household 'sweets', rather than 'cereal', classification. There have been requests to trade in Saturday Sweets in return for a bowl. No rice crispy cakes have been made as they are perfection on their own. Without any milk. Eaten with a teaspoon to make them last longer. * A bicep makes me think of muscle. In the absence of any visible muscle I take this to be a mid-point on the upper arm and hang my head in shame. I've been working on a pattern for a top that seems to be taking forever to get the sleeve just right, however, yet again the Perfect Fitting book has come to my rescue and I'm not too far off something that I feel happy with. Before I realised that drafting this top may monopolise all my sewing time, I ordered some Brussels washer fabric from Kate, intended for a skirt (the Brussels washer is the solid at the bottom of the photo, while the gorgeous fabric at the top was a gift from Kate and it will co-ordinate perfectly to make a waist band or binding). 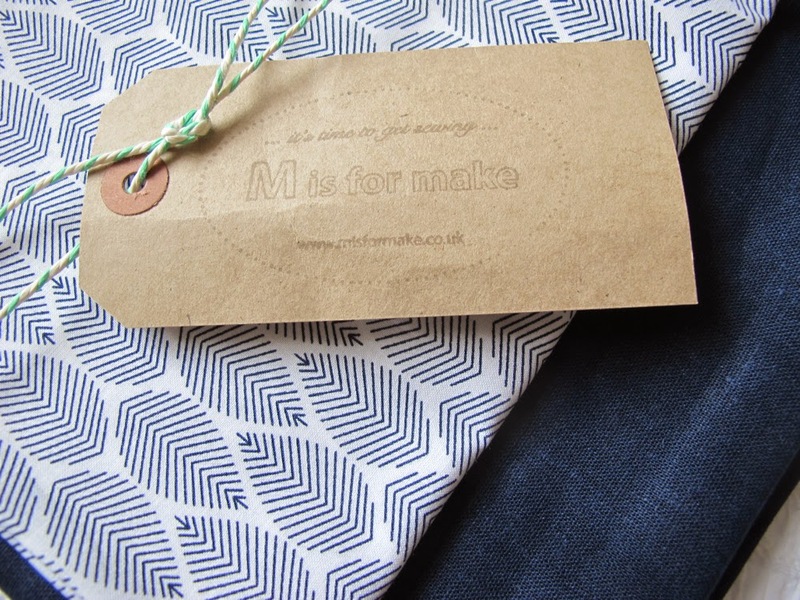 Serendipitously, I'd been about to order some from America, when I saw that M is for Make had just taken delivery of some. 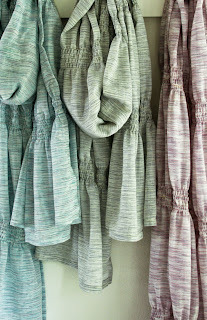 Brussels washer is a mix of linen and rayon. It's not too dissimilar to the Essex Yarn Dyed linen (also made by Robert Kaufman) but that's a linen/cotton mix. The rayon makes it very slightly drapier and so perfect for dressmaking. 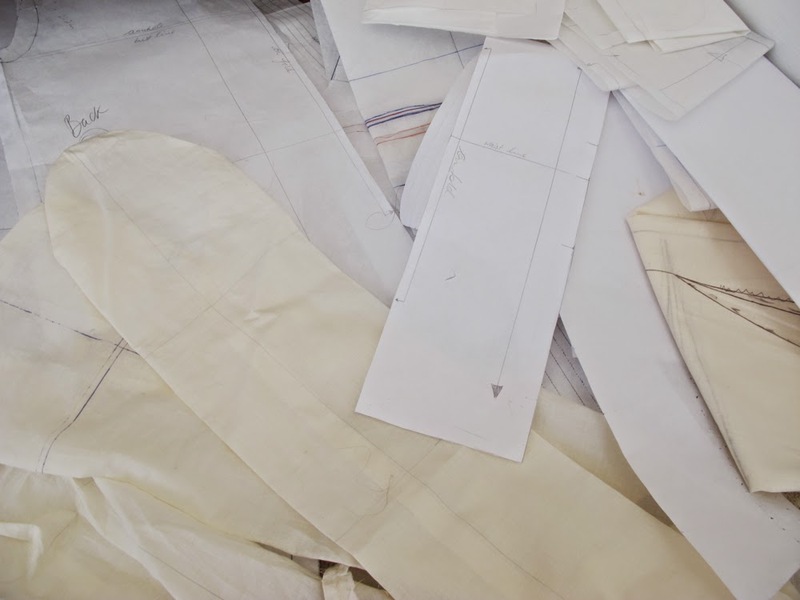 It would somehow work for trousers, dresses and tops, which is quite an achievement for a fabric, but if I had to pick, I'd say I'd be more inclined to make bottoms than tops with it, as I prefer a slightly finer fabric for my top half. But if you have a frame that can pull off a Wiksten tank (my figure somehow doesn't really suit loose clothing, even though I'd quite like it to) then I think it would work well for a top like that with a relaxed fit). I've now pre-washed my fabric and it's sitting waiting for me to do something with it. In other news, I was delighted to be asked by Sew, Mama, Sew if I'd like to judge their Super Online Sewing Match, alongside Gretchen (from Gertie's New Blog for Better Sewing) and Rochelle (of Lucky Lucille). 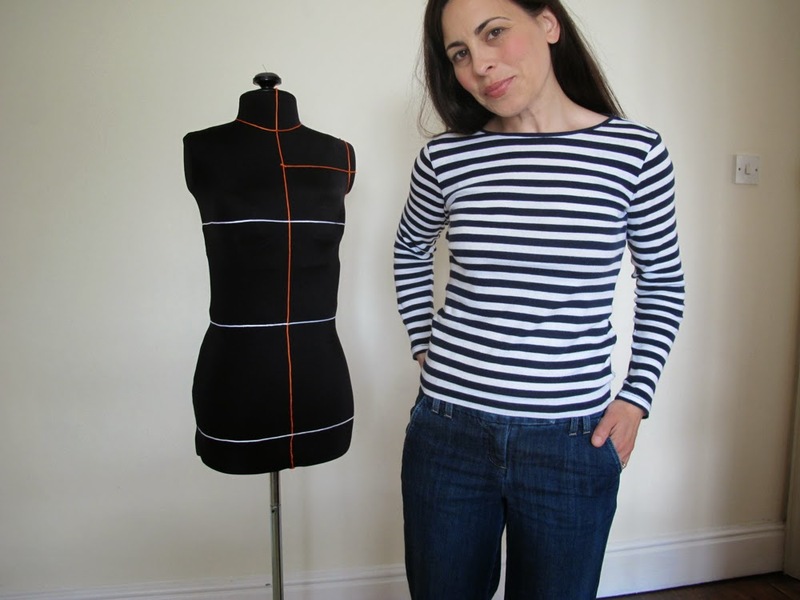 After the success of the Great British Sewing Bee, when Beth said they'd come up with the idea to run an online version I thought it was a wonderful idea. It seems that, despite it being a BBC production, many people were able to watch it in America and would have loved the chance to take part themselves. They've now selected ten contestants and each week they'll be challenged to make something from a particular pattern. I'm so looking forward to seeing what they come up with! Alongside the actual competition (which is sponsored by Janome and has the most incredible top of the range Memory Craft sewing machine as its prize), they're also running a sew-along, where anyone from around the world can submit items made from the same pattern as that being used in the sewing match to the community Flickr group and be in with a chance of winning slightly smaller, but still very lovely, prizes. If you're interested in sewing along, watch the Sew, Mama, Sew blog to find out what the first item to be made is, but either way, I'm really looking forward to seeing the same pattern made up in ten different ways - there's something fascinating about seeing different incarnations of the same pattern (that may be why I return to look through the Colette Patterns Flickr pool on a regular basis). Finally, I know many of you have told me that your children use the educational Squeebles apps that my husband creates (and that I now work on for much of my week too). It's always so lovely to hear that - I'm incredibly grateful that so many people have supported us in our venture and that your children seem to have embraced the Squeebles with such warmth - it's an odd feeling when someone posts a picture or sends an email with a photo of their children using one of our apps...it feels like a weirdly wonderful sewing-Squeebles crossover. (I can only give the - mortifying - example that it's a bit like the kind of double-take moment I used to have as a teenager when a character from the A&E series Casualty, used to pop up in the hospital drama Holby City...there was something oddly thrilling about another element of a familiar person appearing in a different context. That is an AWFUL analogy, isn't it. But perhaps you get the gist. I really love to see the children/teatimey/end of day homeworky side of someone's life when I'm used to only thinking of them in a sewing context. Anyway, that long ramble was a precursor to saying that if you're interested, we've now released a new version of the original times table app. 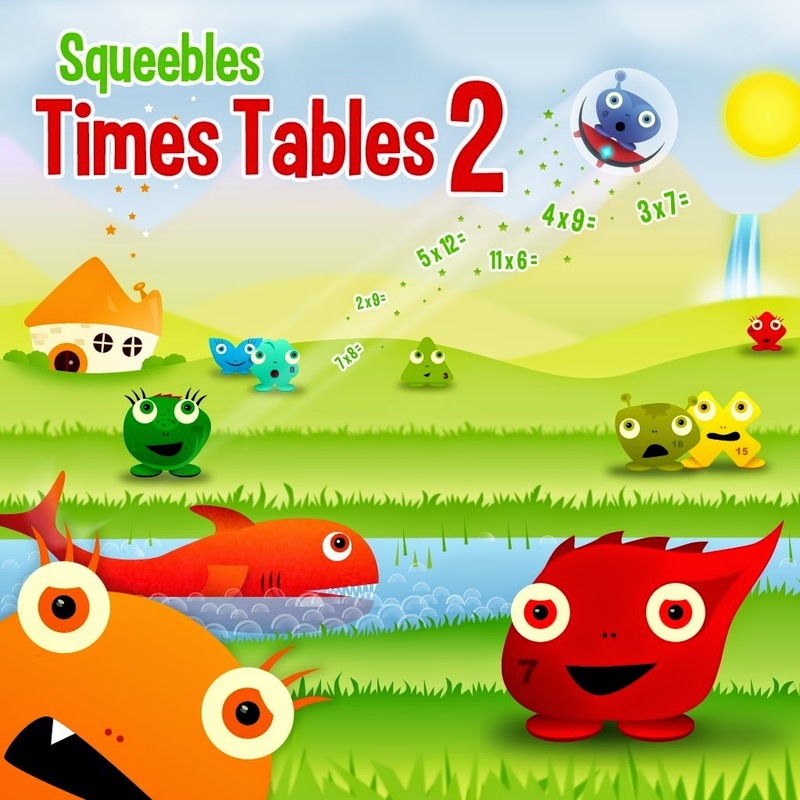 Squeebles Times Tables 2 is much more interactive, has a massively improved stats area so that parents can keep track of their child's progress and, as well as the original motivation of collecting the Squeeble characters, it also now includes a mini-game, called Bubble Ball, to incentivise learning. By practising tables children can earn stars to trade in for better bubble balls (you can see one flying through the air in the picture above) and flip fish (visible in the pond in the picture) who flick the bubble balls with the end of their tails. You can find out more about it on our website, here, or if you want to look at it from a child's perspective, you can read Whizz's introduction to it on the Squeebles' blog for children. 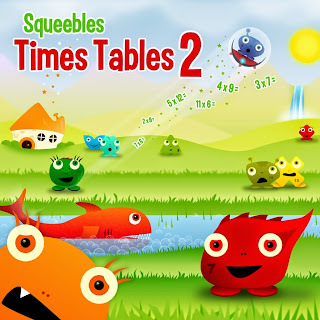 Or, you can find it in the app store by searching for 'Squeebles Times Tables 2' - it's available for android, iPad, iPhone and newer models of the iTouch. We did consider launching this new app as an update, but because it's so different to the original technical issues meant that children would have lost all the Squeebles they'd collected on the old app when a parent downloaded the update...which we though may cause a lot of upset after spending so much time earning them. While we hoped there would be enough excitement over the many new features and game included in the new version for most not to mind, ultimately we didn't want to risk demoralising children if they wanted to retain their progress and stick with the old app, so the two apps run completely independently and the original will eventually be removed from sale. In the comments to my last post a few of you asked for a tutorial on how I'd gone about making the cover for my dressmaker's dummy. Unfortunately, I can't explain this with illustrative photographs as my cover has draping guide lines that I sewed in place on the stand, and having spent two evenings stitching them on it's too upsetting to ever take the cover off again and attempt to reposition it again perfectly afterwards...also some of my stitches may have got caught up in the bra that she's wearing. However, it really wasn't difficult to do, so perhaps you'll settle for my explaining it? As I've never written a blog post without photos, I could choose between using pictures of cute kittens or not particularly helpful photographs of me with my mannequin. I'm saving the small furry animals for another day. And do let me know if you'd like a Nell update post...I have plenty of photos of puppies too. 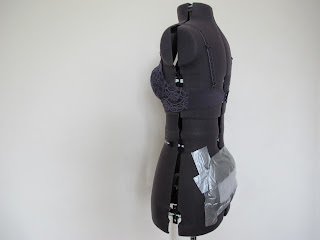 To recap from the last post briefly, before making the cover, I'd padded out the bottom on my Adjustoform mannequin and stuffed a bra to replicate my own curves and my husband surveyed us side-to-side, front-to-front and back-to-back and she really is pretty much an identikit-Florence. Back to the cover. I bought the stretchiest material available, despite the fact that it has an alarming level of shine. Mine is a glistening Lycra with a fantastic four-way stretch - the kind of thing that you could make a leotard or dance leggings from. This is better than a simple jersey as it clings to every curve and it actually goes in at the centre of the bust, rather than standing proud and creating an unattractive mono-bust. That's important. I bought half a metre and managed to make a cover for my failed mannequin and this one from it...but the fabric was very wide and I'm the same height as a twelve year old, so if you're taller you may wish to buy more. 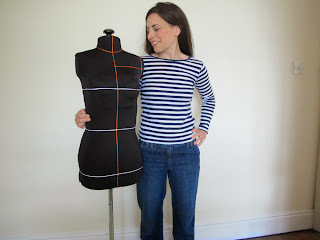 However, because it's meant to be skin-tight and this fabric can stretch so efficiently, you'll need far less than you think - I was amazed when I didn't need to return to the shop for more Lycra supplies after making a cover for the original now-at-the-recycling-centre mannequin. 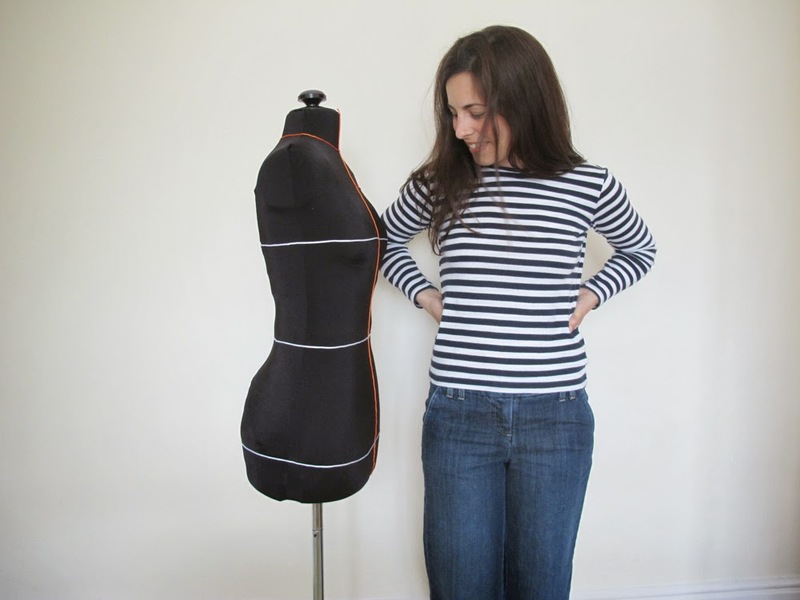 I then sewed a fabric tube with a seam at each side and left the top and bottom open - you'll need to use a stretch zig-zag or an overlocker as this fabric is super-stretchy and will pop a regular seam. 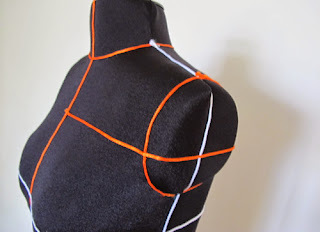 You could cut corners by folding the fabric on one side and just having a seam on one side of the mannequin, but there's something that I don't think will work visually about doing this and it may cause your eyes to itch whenever you look at it, so even though it's just a dressmaker's dummy for stabbing pins into, it feels proper to have a seam at each side. The tube should be a really tight fit as you want the fabric to stay in place and not have loose wrinkles that could move around once you're actually working on it. I removed the finial from the top of my mannequin and put the tube on the mannequin wrong-way-out, with the seams showing. Using a chalk pencil, I drew on lines to mark out the shoulders and the sides of the neck and then across the top where her head stump sits. These lines should be precise - there's no need to add in any ease. I removed the fabric tube and sewed directly on the lines I'd marked out and then trimmed away any excess material, notching the seam allowance on any sharp curves. Finally I turned it the right way out and put it on the mannequin. It was a perfect fit for very little effort - this really is an easy-peasy way to do it. 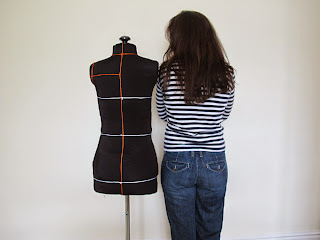 My mannequin has quite large adjustment gaps, but these are pretty much hidden (apart from at the horizontal shoulder seam where it sinks into the gap just a tiny bit more). It really does feel like a very usable, fully-stuffed mannequins as the stretch fabric is so taut across the gaps. I hope that was informative - I'm guessing this is rather a niche post, so apologies to anyone who doesn't wish to cover a body-double in spangly Lycra...normal service will resume later in the week.